Today’s IT teams spend far too much time struggling against increasing system complexity and tools failing to make monitoring easier and more reliable. To combat these challenges, both admins and site reliability engineers need a clear view of infrastructure performance and availability. 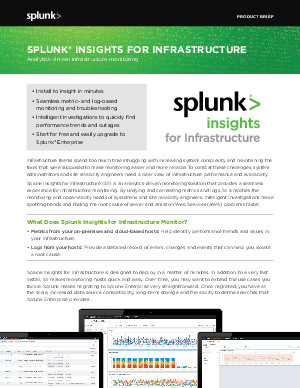 Splunk® Insights for Infrastructure (SII) is an analytics-driven monitoring solution that provides the seamless experience organizations need for infrastructure monitoring on the AWS cloud.